Several students got to participate in KIPP: Jacksonville’s Beloved Community Mural & Student Art Project. Each student created their own interpretation of what Martin Luther King Jr.’s Beloved Community principle meant to them. The mural was designed to celebrating the founders & patrons of KIPP: Jacksonville by combining elements of my I AM Project, along with the concept behind my mural on the Reddi Arts building. This edition of my I AM Project is being called I AM KIPPJAX. 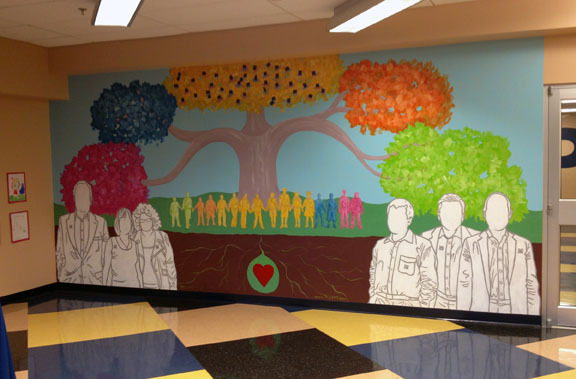 As you can see, in the Beloved Community Mural, the founders are in the foreground represented by I AM KIPPJAX silhouettes. Between them, you will see a seed represented by a heart which expresses the love and commitment that was shown by the founders & patrons to fuel the development and creation of KIPP: Jacksonville in our city. The names of the patrons can be found in the name plates shaped like leaves in the canopy of the tree. Learn more about the founders: Bill Walton , Jane Vance, Congresswoman Corrine Brown, Tom Majdanics, Gary Chartrand, & John Baker.